I've been snail-mailing with a relative lately - good 'ole fashioned letter writing. We've been talking about our faith journeys, spanning nearly a century, and all the ups and downs and wonderings and wanderings involved in so many years of trying to understand the Divine. 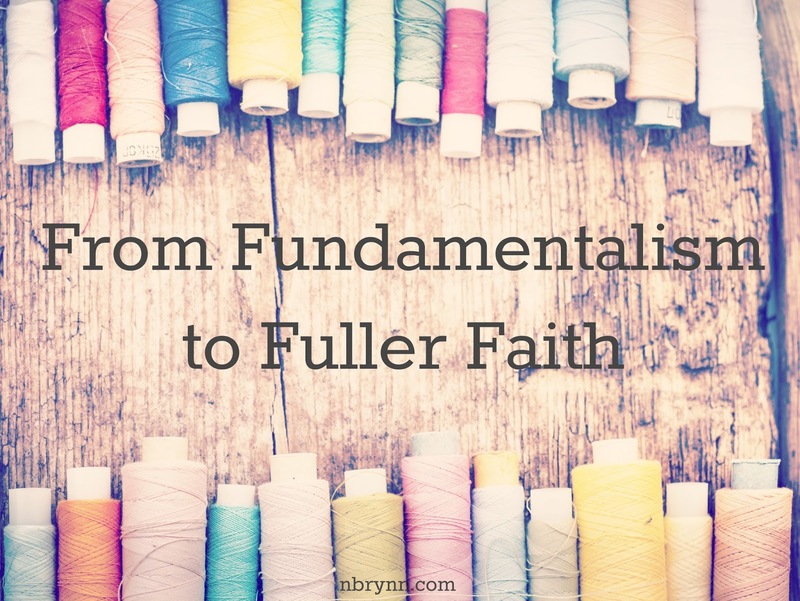 In a recent letter, I found myself writing this: "The truth is, if I had to summarize the past five years of my spiritual journey, I would say I have gone from fundamentalism to fuller faith." At first I felt silly saying this. "Fuller faith" hardly seems like an accurate description of someone who stopped attending church, walked away from traditional religion and gave free reign to all questioning and exploration a few years ago. Someone who swung open the door on "acceptable books" and started reading veraciously from all traditions. Someone who now honors mystery as holy and sacred; questioning as a supremely spiritual act. At the ripe old age of twelve, I began to fret constantly about the eternal state of my soul. Having heard almost weekly for the former decade of my life about heaven and hell, those "in" and those "out," I was growing increasingly uncomfortable about not knowing for sure that I was "in." One night, attending an evening revival service with my best friend and her family, I listened attentively to the yellow-haired, charismatic preacher. I listened to words I had heard many times before, but for the first time, it seemed my cognitive maturity had finally caught up and the words started to make sense. I was a sinner, born depraved and with an evil nature. I would live and die in this state: sinful, flawed, stained in the sight of the perfect God who made me, forever banished from His presence - unless I confessed that all these things about me were true and that Jesus was my only escape. Unless I prayed, with sincerity, that Jesus come live in my heart, cleanse me of my sinful nature, and help me live a life pleasing to God. Then I would be allowed in heaven and God would welcome me as his child. Then God's grand love would fill my heart and make me good. Then I could call Him Father. I walked down the aisle when the yellow-haired preacher asked if anyone wasn't sure where they would go when they died; when the yellow-haired preacher asked if anyone needed someone to save them from their sins and present them as perfect before God; when the yellow-haired preacher asked if anyone wanted to invite Jesus into their hearts and start a life in the Love of God. I walked down the aisle of that old Methodist church, with it's creaky wooden floors and crimson pews in neat rows, tears streaming down my face, cheeks burning with tween emotions. I walked down the aisle, desperate to guarantee, once and for all, that I was “in.” Desperate to be made good. Desperate for a loving Father. Immediately, I started attending youth group every week and followed a reading plan to get through the Bible in a year. I was passionate, excited, committed - what we called “on fire for God.” I spent the next several years doing everything in my power to “fan the flame” - attending weekend conferences, leading Bible studies, showing up at church every time the doors were open. My skirts got longer and my shirts looser, I threw out all my old CDs and replaced them with Barlow Girls and Jars of Clay. I kissed dating goodbye, went on missions trips and attended See You at the Pole. I did prayer walks around my high school, tried to memorize all the right answers and share them with my friends, organized church potlucks and parades. I sat in the front row and took notes throughout the sermon each Sunday. After my senior year of high school, I moved to Texas for a yearlong Christian leadership experience. During my first week, I was handed an enormous, dark green book called, How Now Shall We Live, a book explaining all the ins-and-outs of a Christian worldview, which I studied diligently and thoroughly. I learned why Buddhism was flawed, why evolution was wrong, why only those who believed in “Biblical Christianity” were right and therefore going to heaven. I soon was convinced that there was in fact an answer to every question, and that I was on the winning team that knew them all. Rachel Held Evans describes my decade as a Christian perfectly when she writes in her book, Faith Unraveled: “I used to be a fundamentalist. Not the Teletubby-hating, apocalypse-ready, Jerry Falwell type of fundamentalist, but the kind who thinks that God is pretty much figured out already, that he's done telling us anything new. I was fundamentalist in the sense that I thought salvation means having the right opinions about God and that fighting the good fight of faith requires defending those opinions at all costs. 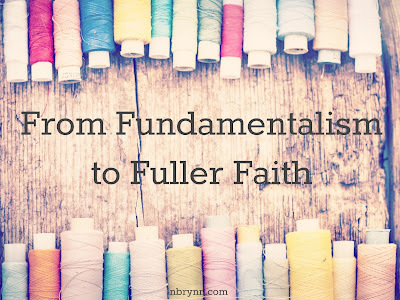 I was a fundamentalist because my security and self-worth and sense of purpose in life were all wrapped up in getting God right - in believing the right things about him, saying the right things about him, and convincing others to embrace the right things about him, too." 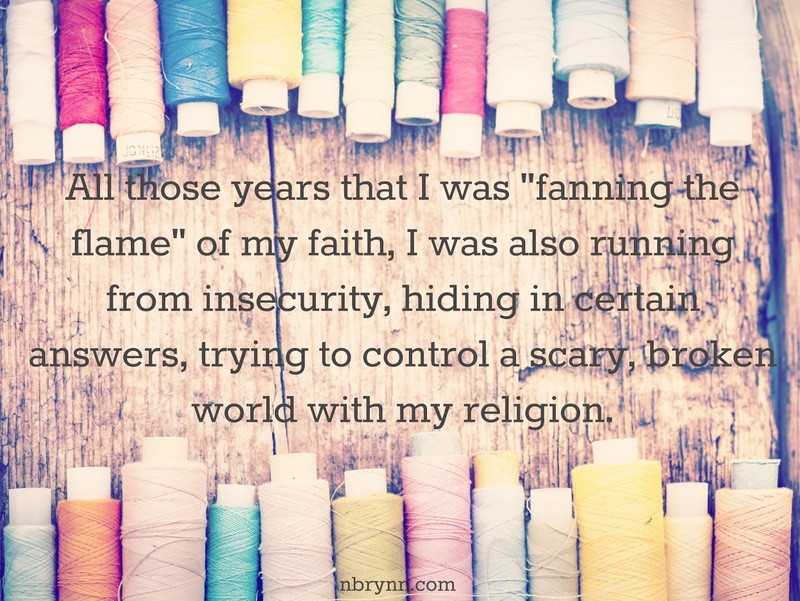 See, all those years that I was "fanning the flame" of my faith, I was also running from insecurity, hiding in certain answers, trying to control a scary, broken world with my religion. I wanted to belong, to be whole, to be right, and I found a system of Christianity that told me I could be all those things, no questions asked. But there are questions worth asking and there's a wholeness that all the hiding never allowed me to discover. Because I used to see God as a Finite Father that only embraced those who prayed certain prayers and read certain books, but now I see a God that is limitless in His love. I used to believe that truth was limited to one ancient text, and more than that, to one way of interpreting that ancient text. Today, I see that the Creator has hidden truth in all of creation, in each one of us. I used to say that Love was ultimate, but I lived in a world that cast constant judgement on those that were "out," those that were "other." Today, I honor the humanity of all people and embrace the "other" in my own home. Yes, it's true. 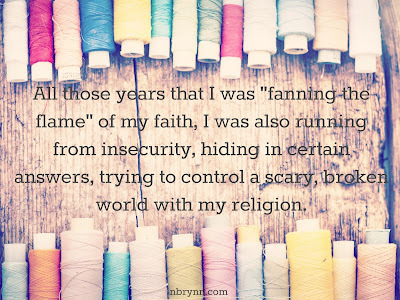 My faith has changed a lot. And for that, I thank God everyday. 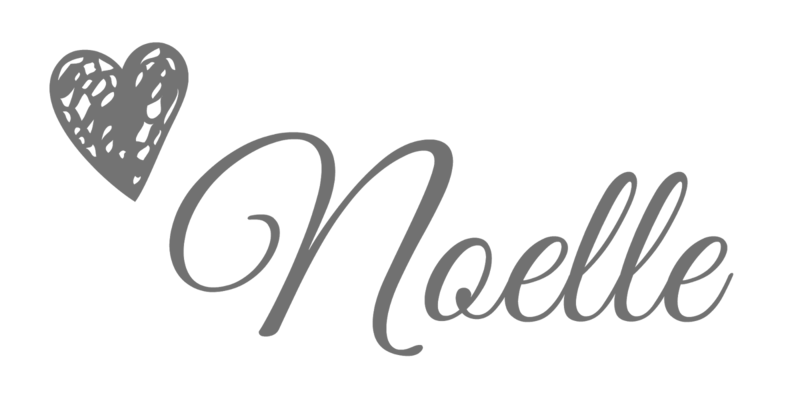 Noelle, I was just introduced to you via your interview in the upcoming issue of The Phoenix Soul. I'm privileged to serve as proofreader there, so I always get a sneak peek at each issue. Your interview there led me here, to your site. Your brave and honest words resonate with the beauty of vulnerability. I am so so glad for you, that your journey has led you to this "fuller faith," because I know from my own experience that the more purely we know God/Love/Grace, then the more purely we can know ourselves and each other. I am so glad to have "met" you <3 . . . . . . big hugs from me, Maureen Blake, fellow child of infinite Grace, mother to the marvelous Amanda Fall . . .